The Nokia faithful has been waiting in breathless anticipation for the arrival of the company's first Android tablet, and that patience is about to be rewarded - assuming you live in China. GSM Arena (via Sina Technology) reported Monday that the world's first Android tablet built by Nokia may finally break cover on January 7, although it's unclear if the device will launch or actually go on sale that day. Either way, the date is only of significance for fans in China, which is where the 7.9-inch Nokia N1 is expected to first make its mark, presumably before what's left of the Finnish giant decides to make tracks for other destinations. Nokia made the N1 official last month after weeks of speculation, but only provided a vague release sometime in the first quarter of 2015, despite having plenty to say about specs at the time. Launching with Android 5.0 Lollipop on board, the Nokia N1 features a 2048 x 1536 touchscreen display powered by a quad-core Intel Atom Z3580 processor clocked at 2.3GHz with 2GB RAM. Packed with a 5300 mAh battery, 32GB of onboard storage and dual cameras (5MP at front, 8MP around back), Nokia's debut on the Android tablet scene will arrive with the company's custom Z Launcher software, rather than a pure Lollipop experience. 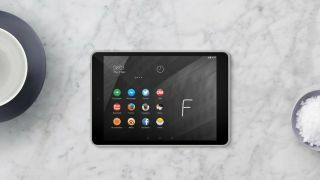 We may have to wait until January 7 to get an exact price on the Chinese version of the Nokia N1, although the tablet is expected to sell for around $249 (about UK£160, AU$307), putting it somewhere in the middle of the Android tablet spectrum.